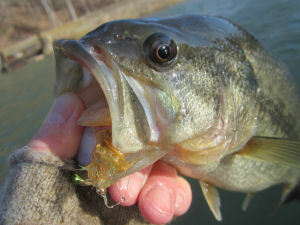 Our spring break vacation to Lebanon, Missouri was full of surprises; as you may have read in last week’s column…the Bennet Spring area received a flood of epic proportions that quite frankly really messed up a lot of my fishing plans. Now I know that there are way more serious issues going on locally and globally for that matter, but fishing is my highlight and I think, plan, tie and calculate at length prior to our trip each spring and the rain that fell, while much needed, put the Niangua into a state of panic, there would be no floating the river in search of giant smallies in my new float tube…and thus the adjustment was simple, I would fish the spring itself. Now, one very good thing about rain and cold temps is that it keeps the usual drove of other fisherman away as I basically had the place to myself and there is some deep consolation knowing that if you can stand the elements…well, the stream is open and it is yours! Such was the case on Wednesday morning, March 13. I had ended up the Tuesday night before with an epic struggle; I had fished for almost 3 hours in stained water that was up and out of its banks and managed to catch about 8 fish in that time frame. I made my way back to the camper, tail between my legs, tied a few flies, watched a couple Walton episodes, had a warm bowl of soup and awoke on Wednesday with a new outlook. Heck, I was all the way there and had a great stream just a few feet away…might as well be positive! I went to my tried and trusted cream colored wooly bugger in size 6 and along with my new 5 weight TQR rod started making cross stream casts. I was casting down and across at 45 degrees and then pointing my rod tip about 2 feet below the surface; this did two things, it helped in getting my fly a few inches lower in the water column and it also put me in direct contact with the fly…one good and powerful strip of the line with my line hand would move the fly quickly about 12 inches, thus setting the hook on most takers. My second cast was still swinging from left to right across the stream when I felt a big tug and without thinking strip set the hook on a nice rainbow…the first of the day! OK…this is more like it; I carefully released the fish and made yet another simple cast…waited, bang, another take and another fish! I don’t know if it was the power of optimism or just ultimately the craziness of fishing for trout, but the next 90 minutes was full of catching, to the tune of 17 total catches. I had now slowly moved downstream and found myself in my favorite Bennet spot, about 100 yards above the dam in zone 1. The fishing was fantastic and on each cast I either caught a fish or had several takes…either way I was focused and enjoying the moment. It was at that moment that I got a very nice surprise…in mid retrieve I felt a big tug on the other end and as my body usually does, I strip set the fly without thinking. This time things were different, something was odd about this fish as it was pulling very hard and staying deeper in the water column. Immediately my mind floated to the possibilities; could it be a big brown, a large rainbow, or what? The next 30 seconds are why we (fisherman) endure a lot of cold and sometimes miserable days…I can honestly say that it is at this point that I LOVE fly-fishing. A few more powerful strips and up through the stained water came a beautiful spotted bass! 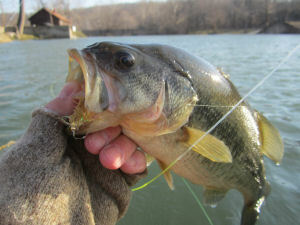 The fish had a belly that told me he had been feeding hard all winter and was doing quite well for himself. I snapped a few photos while admiring this great fish…then I released it back into the murky water, hoping that it grows and someday might just once again thrill me with a truly welcome surprise. If you are looking for good surprises, then get out this spring and let good ole Mother Nature show you all the tricks she has up her sleeve as we all Enjoy the Great Outdoors.